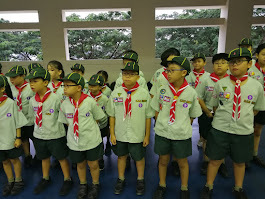 The investiture ceremony will be held from 7 to 9 pm next Friday, 3 March. Parents are most welcome to join us and you will be invited to put on the scarf for your child during the ceremony. If the weather is good, we will have the ceremony at the courtyard. However, if it rains, we will have it in the hall. Pupils will report for CCA at 2pm as usual and stay on till we break camp on Sat, 12noon. Kindly pick up your child at the Meeting Point by 12 noon. * Dinner, supper and breakfast will be provided. * As there has not been any offers for organized jobs on Saturday morning, we will stay in school to work on some camp craft. Do contact any of the teachers through email or class dojo if you need any clarification.